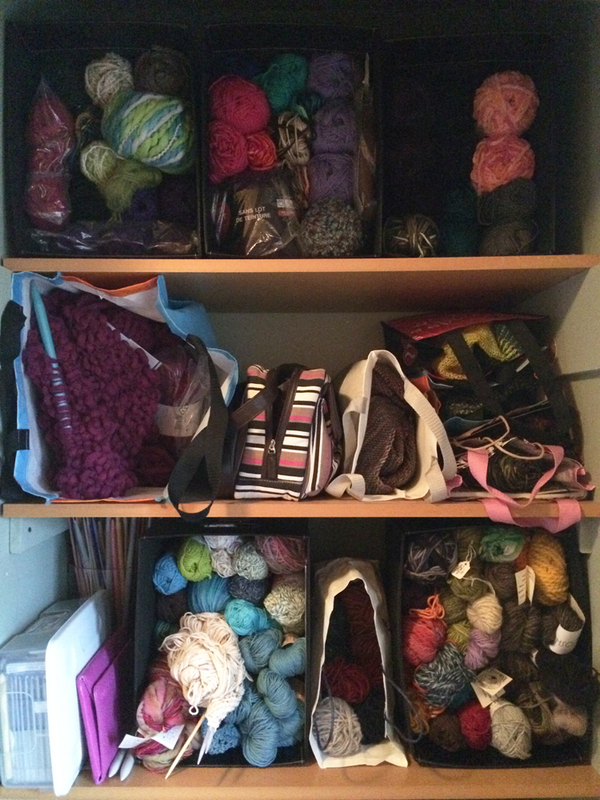 I recently read an article which gave advice about “how to get your yarn stash under control”. The information, in step by step order, was perfectly reasonable. But when it comes to the topic of a yarn stash, the instructions sounded as foreign as a photo of a 1950’s housewife greeting her husband at the door after work with a martini and a kiss on the cheek. I mean really, a yarn stash for most knitters is not getting sorted out in a few minutes or hours, as the article claims. This is a recipe, for us dedicated yarn stashers, to just feel bad about ourselves. I did take a few minutes to look at my yarn stash. And a few minutes more to snap a some photo’s. I was a bit surprised at how much was there, for sure. And also a little sheepish when I took count of how many projects I have on the go. No less than 12 “dreams of completion” which are on needles. Clearly I need to pull out the needles and wind up some yarn. Convert those babies back to a state where I can be inspired about what they might become one day. Maybe there are a few projects which can be finished, sooner rather than later, maybe. For me, the point of knitting goes way beyond the completed item. It is a creative, soothing and dreamy process – stitch by stitch as the yarn ball gets smaller and smaller. I often give the finished stuff away. By the time I’ve put the hours into a project, I’m tired of looking at it. There are a few things which have turned out well. At least they resemble what I thought they were supposed to look like. Those I keep and enjoy wearing or using. (Dishcloths, I always keep). I am jealous. That is so much more impressive that my collection. I just went through mine and decided which patterns went with which yarn. It will take me years to finish them all. At the rate I am going, I will never finish what I have started! Let alone the whole stash. Then there is the business of this monthly club….